Is there truly anything that McGarry can't write? Each new book, each new story just seems to get better and better. And not only better but so much more memorable and she just knows how to hit you right in the feels and let me tell you, this book is all about the feels! I liked Razor from book one but I wasn't quite sure if he would be able to win my heart over, but oh boy did Katie have me changing my mind about him and his gruff exterior. He truly was a surprise and such a wonderful character. Flawed, damaged but still knew how to love and love well. He is fierce in his promises and in his love. I seriously drooled over him he is that well written and fleshed out. Katie McGarry is truly one of the few YA contemporary authors that I come back to time and time again because I know she will deliver. And not only does she know how to write her swoon worthy heroes but her heroines are just as feisty, tough and lovable. I adored Breanna from the very first chapter and wanted more of her story. I felt so much for her in this. She isn't damaged in the typical fashion but rather over worked and overused by not just her parents but all her siblings. She is under appreciated and yet with all that is on her plate, she still has a heart of gold and can see past what others can't. This story was just so much more than what I was expecting and completely restored my faith in this genre. This isn't the same old storyline with a new buff shininess to it. It stands and shines on its own and is really just that good. It will make you laugh, make you smile, make you cry and even make you melt. This was an outstanding second book to the series and I'm eagerly waiting for more. I'm glad you loved this, Ali! I adored Razor and Breanna together, but I was a little (A LOT) frustrated with the family and the boy who blackmailed Breanna to be able to enjoy the book completely. I'm excited for Chevy's book! Her family really frustrated me as well Nick but I'm glad it ended realistically in a way for her but I was still sad with the way a lot of things were handled. So happy to see you liked this one!! I have the first and plan to read it soon and love to see when a follow up book gets love too. Great review! I think I actually liked this more than the first so yay! I hope you enjoy them both too! I'm glad that you liked this book. As I'm reading this, I wonder why parents make their oldest kids raise the youngest kids. Don't the oldest kids deserve to have a childhood too? I can see helping out here and there, but overworking them just seems so wrong. I've know so many people who have had that happen to them. Anyway, great review. It makes me so mad Melanie! I wanted to smack her parents so many times for their bad parenting it was sad. I don't read YA often, but this looks like something that would interest me. Thanks for bringing it to my attention. This looks like a good series! I have a hard time sometimes finding contemporary that I like, but this looks very good! I'm glad you enjoyed it so much. I like books that are all about the feels as well. Fabulous review! Her book that I read nearly killed me dead. SO MUCH EMOTION! It was so hard for me that I didn't read more. But lately I've been more in the mood for books that gut me so maybe I should get back to her. This one sounds good! They do have a lot of emotion in them and they can be tough sometimes. You definitely have to be in the right mood for them. Phew! 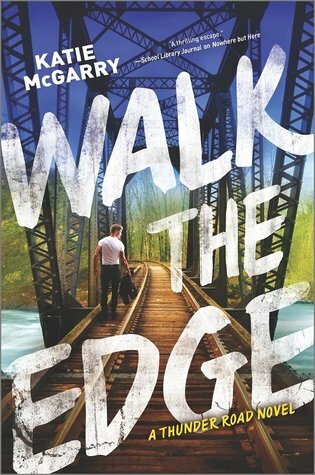 Glad to hear the book didn't suffer from the second-book syndrome ^_^ Too, Walk the Edge sounds like a sizzling romance and I can't imagine the feat in creating a world with fight clubs and biker-type road trips! Great review! I love the whole biker aspect and I truly wasn't expecting that at all when I picked up the first book. NIce to hear that this didn't fall into the same old same old rut. I really need to read something else by her. Yet another author I have yet to read. I mean am I getting that bad at picking books that I might actually like. I'm getting on this author soon. Great review! Thanks Jazmen, I hope you like her work! Okay, I'm very looking forward to this one. I liked book one, but wanted more. So glad you enjoyed this! If you liked the first one you will like this one too I think. You really enjoyed this book. I was wondering if she wouldn't pull this series off for me, but now I know I need to read it with the second one being so good. I'm behind on my McGarry reading but this one will make the list! She pulls it off really well I think. You both love and hate the club sometimes I think, or at least I did and it very much feels authentic to me. It's so fun reading that you didn't know if you'd like Razor but she totally turned it around her. Like music to an authors ears! I have this coming up. No way can I pass up a McGarry book. Was Breanna in the first one? I can't remember. I don't remember her at all from the first book so I'm pretty sure she wasn't in it. Oh wonderful! One day I'll really have to read the author! Definitely try her if you like this genre at all. A little gruff you say? I'm loving the sounds of Razor. That's my favorite kind of hero. Glad you enjoyed this one! Yay another great read from Katie. I had the pleasure of having her come to my school and speaking to my students. Ever since then I can't keep her books on my bookshelves! That is awesome to both counts!! I remember your review of book one, so I am excited this was stronger and Razor won you over!! Okay, this sounds like a series I should try even though I tend not to read YA contemps. I love it when a author can change your mind about an character like she did with Razor. I'm really amazed how well McGarry managed to bring MC books and YA/NA together. I'm excited to read this book! She did it fabulous and I admit, I was really nervous with the first one but she did it and this was even better than the first I thought. I can't wait to read this one. I loved the first book in this series, so I'm excited to see that the next one is just as good! !